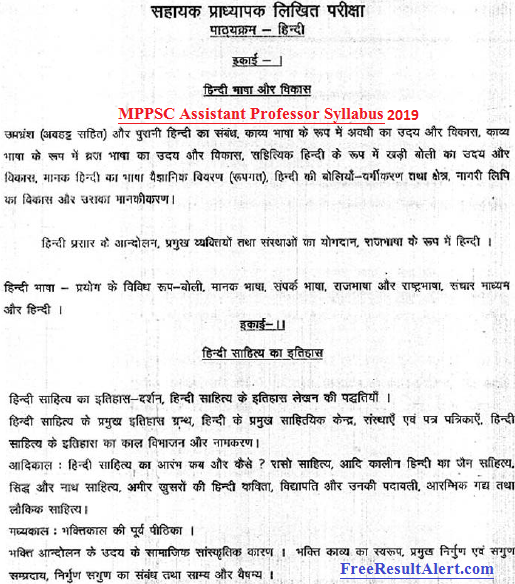 MPPSC Assistant Professor Syllabus 2019:- M9PPSC Assistant Professor Exam Pattern 2019 and MPPSC Assistant Professor Syllabus Download PDF in Hindi Form mppsc.nic.in 2019 Official Portal. Are you one of those who has applied for MPPSC Assistant Professor Recruitment and looking for MPPSC Assistant Professor Exam’s full syllabus. Then this place will be for you. Check here the 2019 Subject Wise MPPSC Assistant Professor Exam Pattern. As many candidates struggle to find the complete syllabus for each topic. Our team has included subject-specific wise syllabus as well as a pdf is also available for subject applicants. Madhya Pradesh PSC professor exam assistant is basically a mix of two papers i.e. paper-1 and paper-2. Both papers contain different topics, different 2019 MPPSC Assistant Professor Exam Pattern, different types of questions. We’re going to discuss both papers here. Candidates can read the details of the assistant professor’s MP public service commissions in the 2019 MPPSC assistant professor Syllabus PDF file below. Candidates will also find the concerned subjects syllabus pdf file. ✒Paper-2:- This paper includes the concerned subject which the candidates have chosen for the exam. Madhya Pradesh PSC Assistant Professor exam pattern is available here. Candidates can see the complete exam pattern of MPPSC assistant professor exam and MPPSC Assistant Professor Syllabus 2019. The MPPSC recruits candidates and candidates also take an interest because it is a govt. sector job. ✒ Paper-1:- Read the complete MPPSC exam pattern for paper-1. ✭ This exam is Objective type (MCQ) based. ✭ 100 questions will be there. ✭ Total marks is 100. ✭ Duration of this exam is 1 hours 30 minutes. ✒Paper-2:- Read the complete MPPSC exam pattern for paper-2. ✭ It is having 150 Questions. ✭ Total marks on this subject is 300 Marks. ✭ Duration of this exam is 2 hours. Note:- If candidates want more updates they can stay visiting our website. More details will be updated here in upcoming days. Open the official website of MPPSC i.e. www.mppsc.nic.in. Search tab for MPPSC Assistant Professor Syllabus 2019. Then, MPPSC Admit Card for Assistant Professor 2019 will appear on the screen.